The exact botanical name is Solanum lycopersicum, the second part of which translated means "wolf-peach." Wolf, apparently, because it was considered poisonous and peach due to its shape. There is also some speculation that the “lyco(s)” part of the name, Greek for wolf, may have been due to the belief that this plant attracted wolves. A close cousin of the tomato has grown in Europe for thousands of years, but it was the Mesoamericans who cultivated and eventually consumed a version of it that was not poisonous or deadly. Early on the tomato had to be poisonous. It is, after all, a close relation to deadly nightshade being of the same family Solanaceae. Another name for deadly nightshade is belladonna. 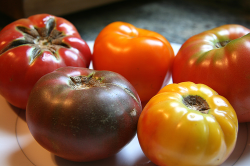 Green tomatoes, unless cooked, contain a poisonous alkaloid called tomatine. This toxin is known to cause weakness and confusion in the person ingesting it. This means someone in the Americas, before this landmass was known as the Americas, had to select a safer version, grow it, consume it and determine, by trial and error, which versions were safe to eat. Further the grower, or perhaps a long line of family growers, had to keep trying to come up with a less toxic version of the plant so they could eat it. Still, though the tomato is a close relative of the potato, it does not have nearly the toxins in it as the tuber. Though the tomato berry is classified as a vegetable, it is actually a fruit. No other part of a tomato plant should be eaten, only the berries. The tomato is known to have been food in Mesoamerica since at the latest, 500 BCE. What we can speculate is that the edible version had to have been developed earlier than that. I say "had to" because a wild version still exists and it is toxic. The tomato gets its name from the Aztec word xitomatl, or the Nahuatl word tomatl. The name literally means “plump thing with a navel.” Aztec writing designate that the tomato may have been a small yellow fruit about the size of today’s cherry tomato. One Aztec recipe indicates that it was prepared with corn and pepper as a form we might recognize today as salsa. As with the potato, Spaniards returning from the Chilean and Peruvian regions of South America brought the tomato back with them. The first written reference in Europe was in 1544 by Pietro Andrea Mattioli, an Italian physician and botanist. He named the plant pomo d’oro, or "golden apple." Mattioli grew the plant as a decorative, not as an edible. Acceptance in Europe was spotty at best. People recognized the plant itself as a nightshade (or belladonna) plant and fully expected it to be poisonous. Still, it was quite popular as an ornamental. In the 1590s tomatoes were being grown in Great Britain again as an ornamental plant. Though a well known botanist John Gerard reviewed the tomato and recommended it for its beauty, he felt it was not good to eat, even though he knew it was eaten in both Spain and Italy. A cookbook published in 1692 in Italy featured the tomato prominently, but many if not most of the recipes seem to be have been Spanish in origin. The plant was mentioned in the British Isles in 1710, when William Salmon wrote of seeing them in South Carolina. These may have been introduced from the Caribbean. Thomas Jefferson, who ate tomatoes in Paris, sent some seeds back to America. By the 1850s the tomato was being cultivated on some Carolina plantations, and probably in other parts of the Southeast as well. By 1799 the tomato had made it to Asia and was eaten both raw and in soups. Shortly after, the tomato made its way to Iran through Armenia where it was called Armani badenjan (Armenian eggplant). Currently, the name used for tomato in Iran is gojeh farangi (French plum). Alexander W. Livingston of Ohio began trying to come up with different cultivar of the tomato to make the fruit more commercial. His intent was to shorten its growing season, affect its shape and color, and increase its sugar content. Today almost half of all tomato cultivars can be traced directly back to Livingston’s efforts. His attempts were met with great success. He was able to grower larger, fleshier, and higher sugar content tomatoes. The Paragon, Acme, Perfection, Golden Queen, Favorite, Beauty, Potato Leaf, Stone, Royal Red, Gold Ball, Buckeye State, Aristocrat, Large Rose Peach, Honor Bright, Dwarf Yellow Prince, Magnus, Aristobright, Royal Colors, Dandy Dwarf, Multicolor, Princess, Grandus, Dwarf Stone, Dwarf Purple, Globe, Hummer, Coreless, Manyfold, Rosy Morn, Giant Oxheart, Hansing’s Improved Wilt-Resistant Marvel, New Yellow Oxheart, Ohio Red, Ideal, and Main Crop Pink are all cultivars Livingston created. Livingston made the tomato his life’s work. From 1856 through 1898, when Livingston passed away, he saw his company grow from a small consolidated operation to one of the largest seed suppliers in the United States. Starting in Reynoldsburg, Ohio the company moved to Columbus then opened another farm in De Moines, Iowa. Due to his son's works the business thrived in Ohio and the farm in Iowa bolstered seed "production." 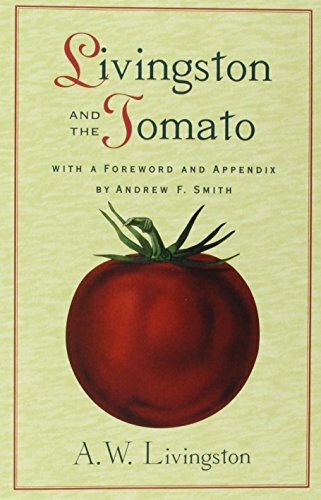 In 1890, after his wife died, he returned to Ohio where he began work on his book “Livingston and the Tomato.” (see below) The book was an autobiography, instruction manual, agricultural history and recipe book. Lycopene, an antioxidant, increases when tomatoes are cooked. The leaves, stems, and green unripe fruit contain the toxic alkaloids tomatine and solanine. Both of these are poisonous and found in all nightshade family plants. The levels of these two compounds are generally too small to cause death, but they can lead to stomach upset, drowsy states, and nausea. 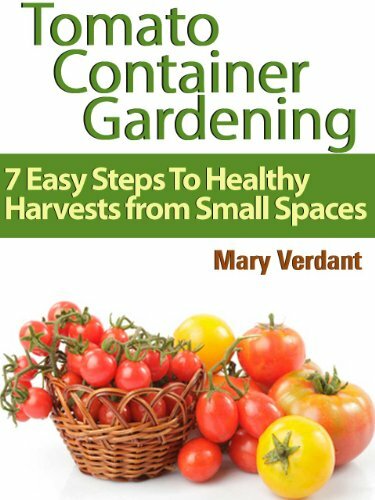 Given that small amounts of tomato greens can be used for flavoring without bad effect. The green fruit can also be cooked (which breaks down the alkaloids) and is very popular in southern states in the form of fried green tomatoes. Tomatoes, when compared to potatoes, have even less of the solanine compound. There has not been a case of reported tomato poisoning in over fifty years. The leaves and stems of the tomato plant can be toxic to dogs and cats. Thanks katiem2 and welcome back. Have I ever told you tomatoes are my most favorite food? There is nothing in this world (in terms of food) better than a vine ripened tomato fresh off the vine with salt eaten straight out of the garden. I can eat them till my belly swells. love Love LOVE this article a much deserved editors choice award congrats! 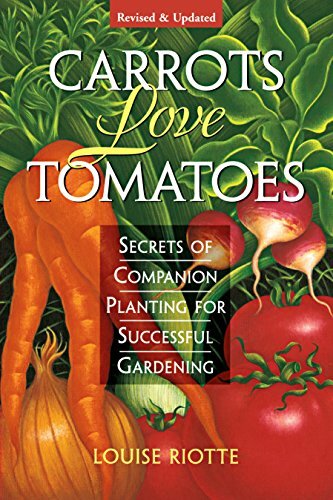 Love my tomatoes, fascinating to learn more of its history. And I do cook green tomatoes - now I'm glad I do that! Excellent history and interesting facts about tomatoes. It is such a healthy and tasteful vegetable that it is no accident that nowadays is so popular and part of most people's daily diet. Peggy: Well the toxin is mild and you may be one of those people who have a stronger resistance to the toxin tomatine. According to horticultural sources the Tomato contains small amount of tomatine. In fact the source I found states that eating the greens, making tea, or eating the green fruit should be safe so long as large amounts are not consumed. An example of unsafe levels would be a side dish of tomato greens. I love tomatoes and find it interesting to learn that eating raw green tomatoes is bad. WeaselPuppy: I was surprised to learn that as well. Eggplant is also in that family. Salsa is definitely better than ketchup! Hmmm - didn't know potatoes and tomatoes were related. Very interesting. belinda342: So are potatoes. This may be the real reason Europeans were resistant to eating them at first.